I had the pleasure of doing a collaboration with the dynamic and bubbly Cas and Chary – their channel is excellent and their Mixed-Reality recording is second to none on YouTube, do check them out. 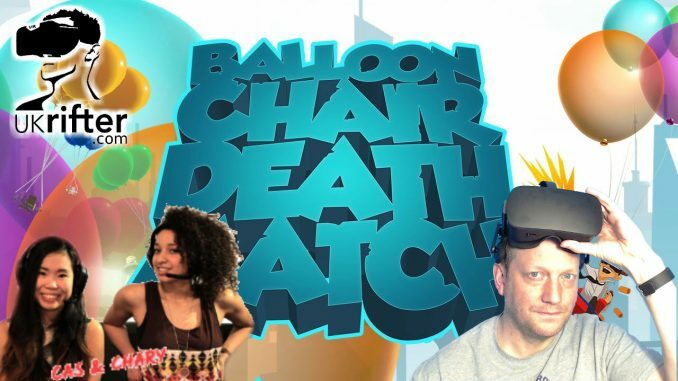 We played balloon chair death match. It’s been out for a while, but I have been a bit slow on my reviews due to a minor skin cancer diagnosis which has meant a series of operations exactly where an HMD presses down which is a bit of a shame. I noticed that the dev of BCDM gave me a couple of extra keys which I am happy to share with the community via my video. BCDM is a cracking game, simple but manically fun. You are sat in a chair, suspended precariously by a number of balloons. You have to fly around a cityscape, inflating your balloons to adjust your height, while your opponents attempt to pop them and send you crashing to the ground below. I won’t lie, the vertigo is considerable, a got a little sick but it is good to see options in the game to reduce this (and they work). BCDM is $14.99 (US$) and £10.99 (GBP). Works perfectly on Vive and Rift. 4) Say something witty in the comments!